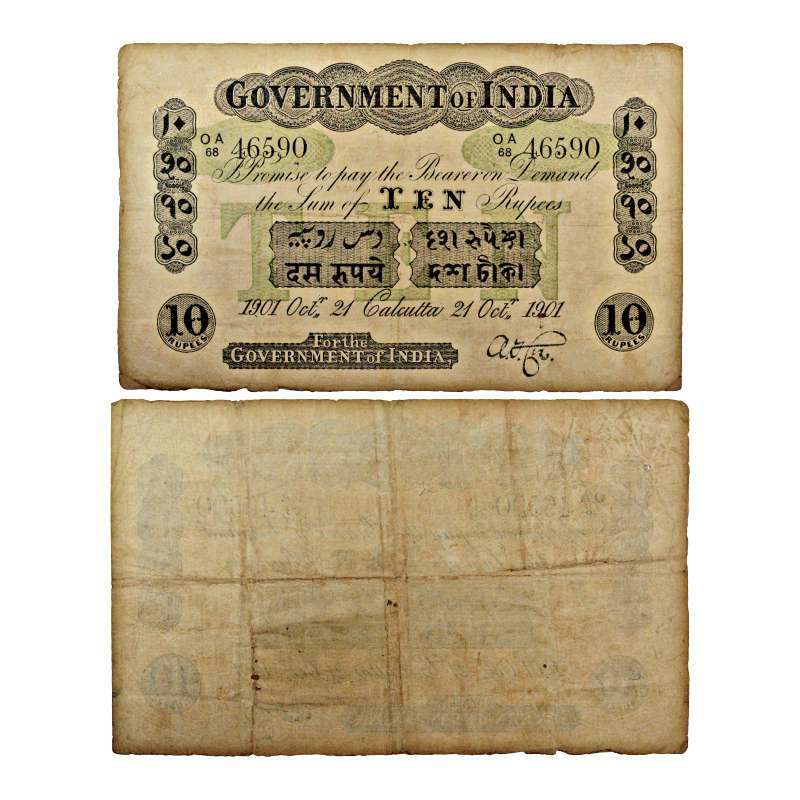 Bank of Hindostan, 16 sicca rupees (1 gold mohur), 1830's issue, unsigned. Central denomination in italics, Arabic numeral and in numerals and words in Persian in vertical panel on either side. 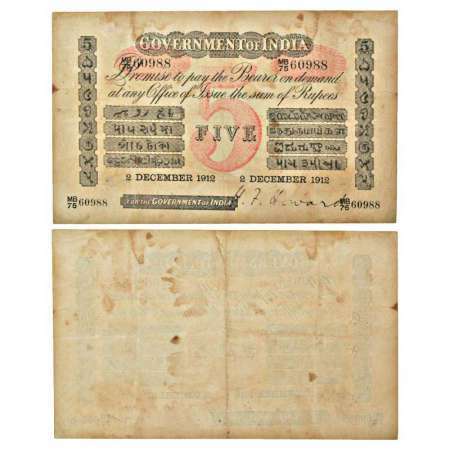 BANK OF HINDOSTAN in Hindi, Persian and Bangla below promise text. Sixteen below promise text. Two dates and two serial numbers on either side and payee's name. J & R 1A.1.4.3. 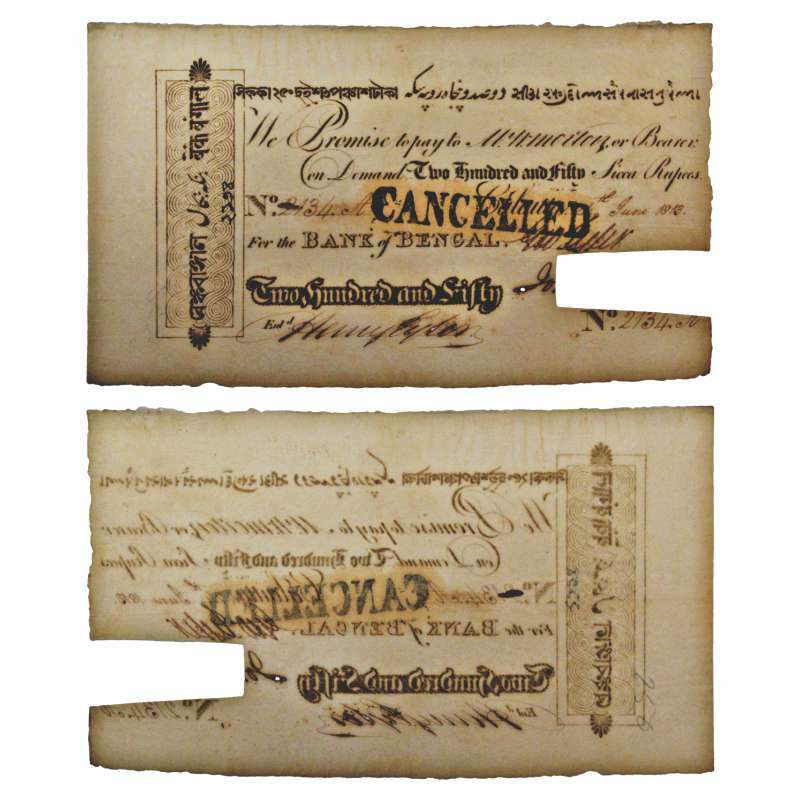 Bank of Bengal, 250 sicca rupees, Calcutta, hand signed, dated 24th June 1813, serial no. : 2134A. 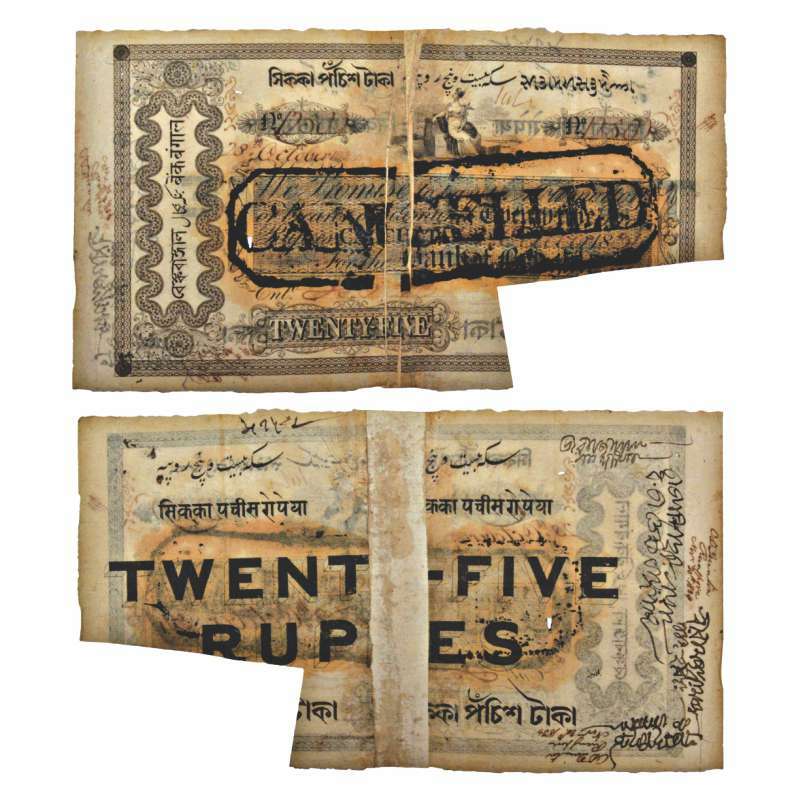 Obv: Bank of Bengal in ornamented panel of left in Bangla, Persian and Hindi, serial number on either side and denomination on lower left. Rev: Blank. J & R 1A.3.1.1. 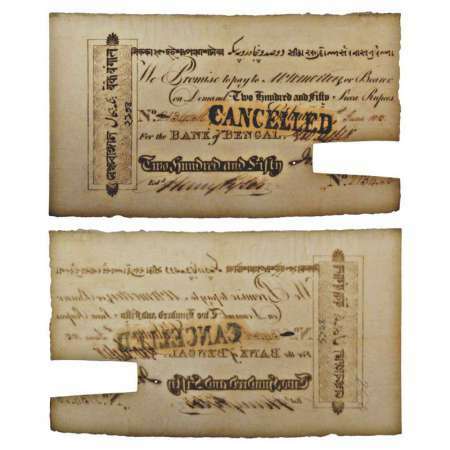 Cancelled stamp on obverse, Signature cut, Extremely fine, Very rare. Bank of Bengal, 1 gold mohur (16 sicca rupees), type 1, hand signed, dated 7th September 1816, serial no. : 53. 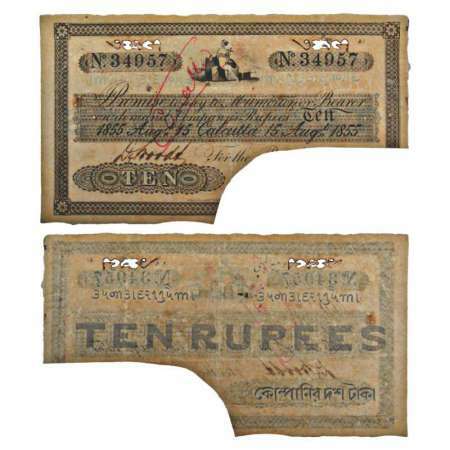 Obv: Bank of Bengal in ornamented panel on left in Bangla, Persian & Hindi, serial number in top left and lower right, ONE GOLD MOHUR in denomination panel in lower left. Rev: Uniface and ink-annotation. J&R 1A.3.2.1. Cancelled stamp on obverse, Signature cut, Very fine+, Extremely rare. Bank of Bengal, 10 sicca rupees, Calcutta, hand signed, dated 3rd December 1833, serial no.:18824. Obv: Bank of Bengal in ornamented panel on left in Bangla, Persian & Hindi, serial number on either side and denomination on lower left, cancelled stamp. Rev: Denomination in words in bold English in center with Persian, Hindi and Bangla on either sides, J&R 1A.3.6.1. Signature cut, Re-joined with paper tape on reverse, Very fine, Very rare. 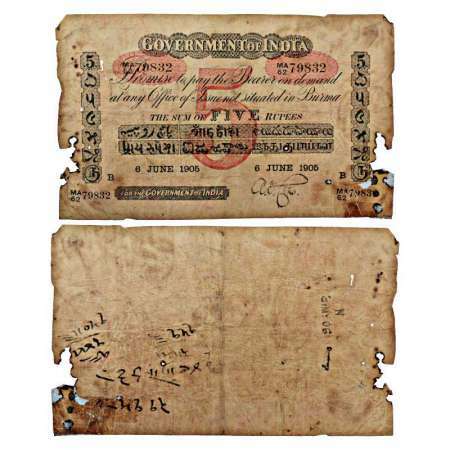 Bank of Bengal, 25 sicca rupees, Calcutta, hand signed, dated 28th October 1824, serial no. : 1250. 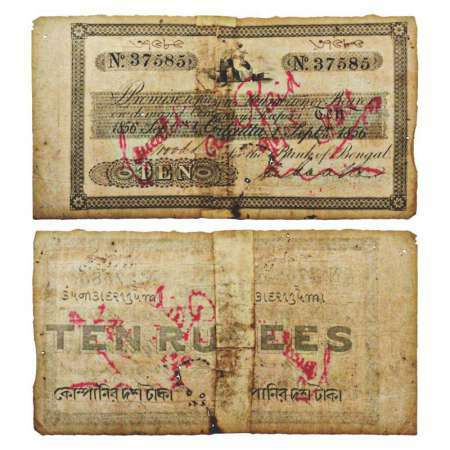 Obv: Bank of Bengal in ornamented panel on left in Bangla, Persian & Hindi, serial number on either side and denomination on lower left, cancelled stamp. Rev: Denomination in words in bold English in center with Persian, Hindi and Bangla on either sides, J&R 1A.3.6.4. 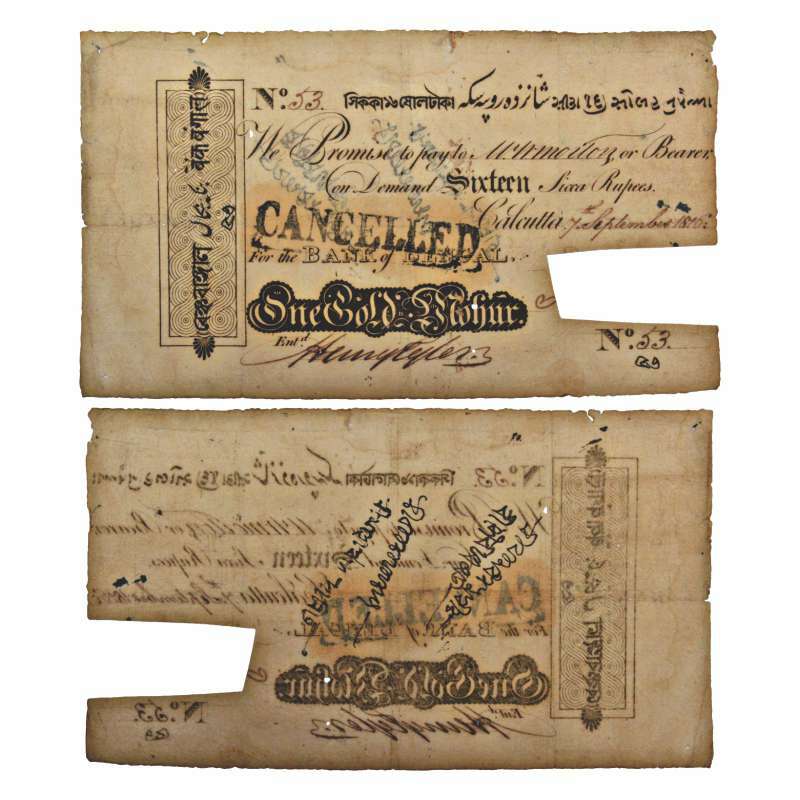 Signature cut, Re-joined with paper tape on reverse, About extremely fine, Very rare. Bank of Bengal, 100 sicca rupees, Calcutta, hand signed, date not clearly visible due to heavy rubber stamp , serial no. : 52013. 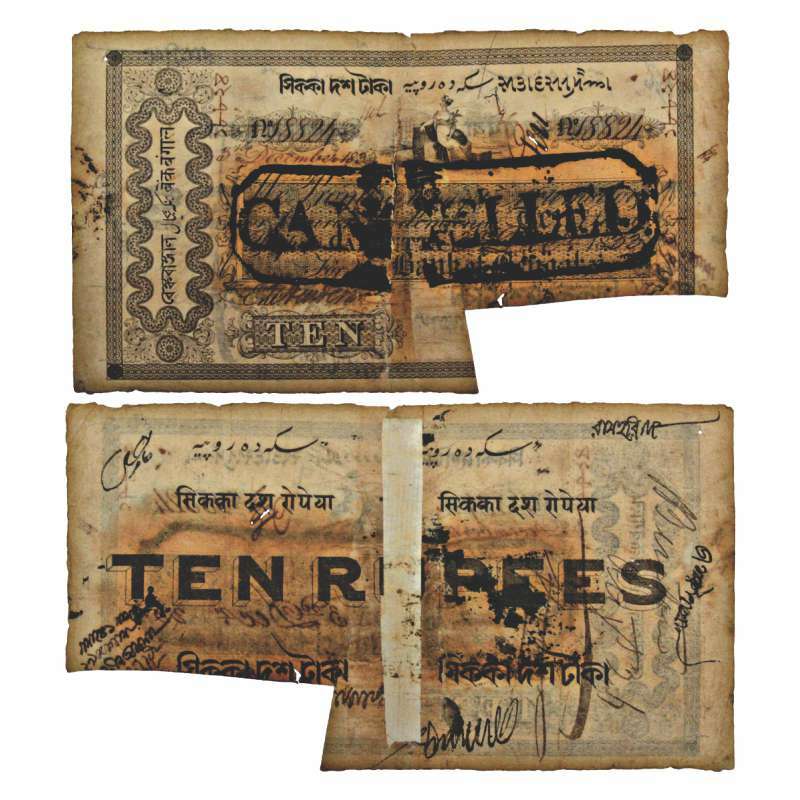 Obv: Bank of Bengal in ornamented panel on left in Bangla, Persian & Hindi, serial number on either side and denomination on lower left, cancelled stamp. Rev: Denomination in words in bold English in center with Persian, Hindi and Bangla on either sides, J&R 1A.3.6.6. 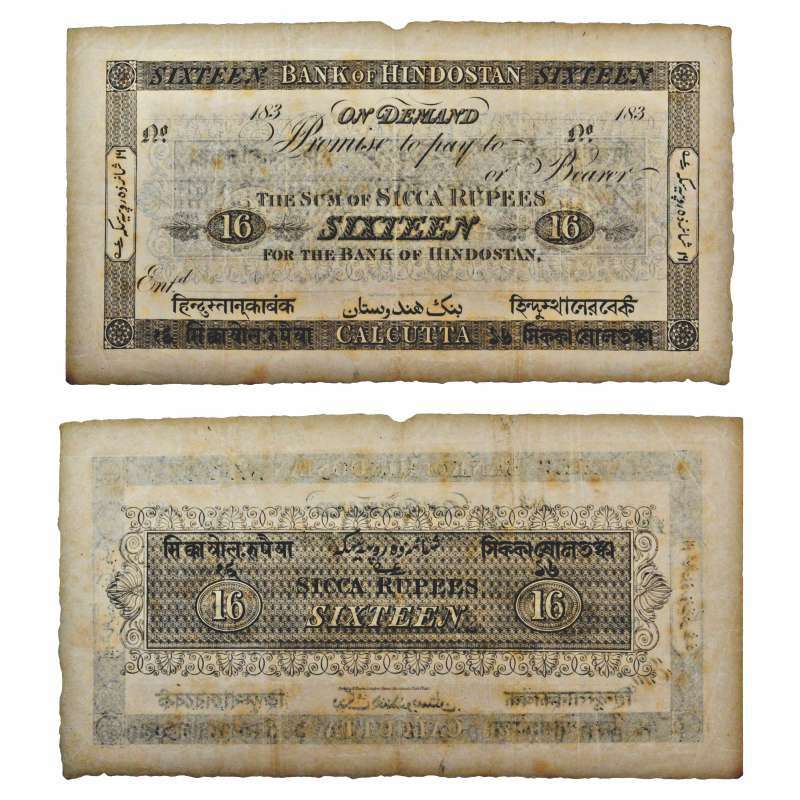 Bank of Bengal, 10 sicca rupees, Calcutta, hand signed, dated 15th August 1855, serial no. : 34957. 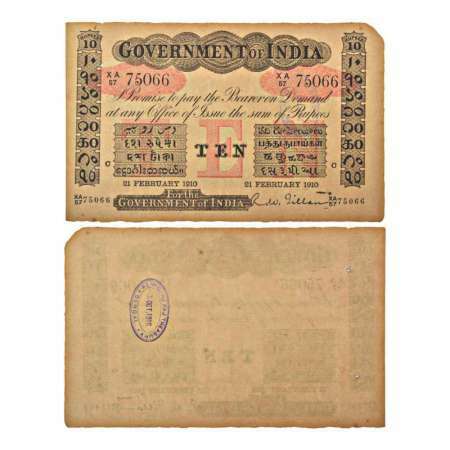 Obv: Personified “Commerce” sitting on articles of merchandise in center, Calcutta in promise text, printed serial number on either side, two pre-printed date in promise text panel on either side, TEN in denomination panel in lower left. Rev: Denomination written in Devanagari, English and Bengali, J&R 1A.3.9.1. Signature cut, About extremely fine, Very rare. Bank of Bengal, 10 company rupees, Calcutta, hand signed, dated 1st September 1856. 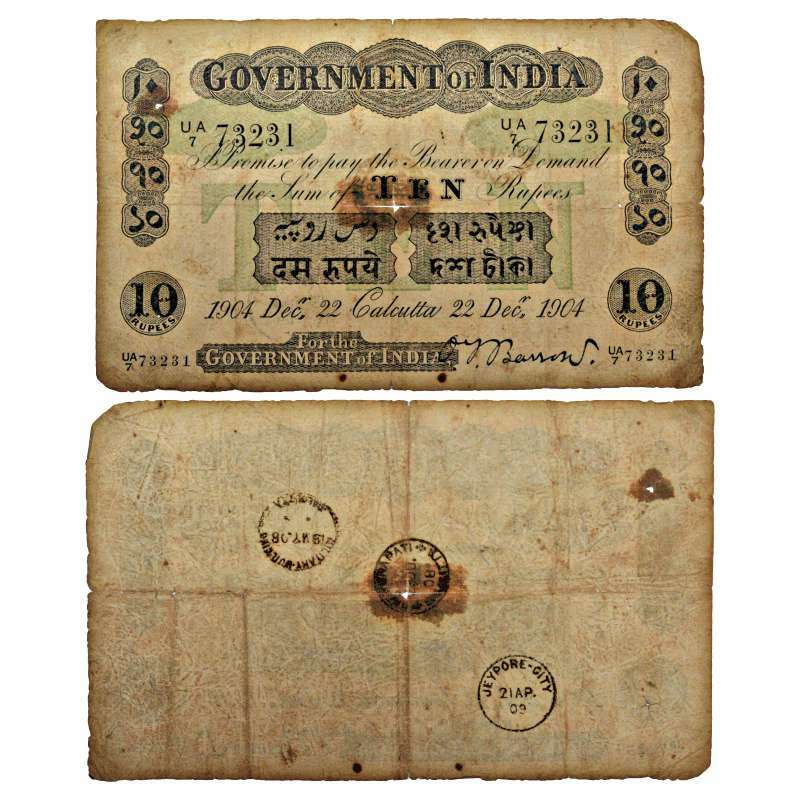 Obv: Personified 'Commerce' sitting on articles of Merchandise in centre, Calcutta in promise text, printed serial no. : 37585 on either side. Rev: Denomination written in Persian, Devanagri, English and Bengali, printed in England. J&R 1A.3.9.1. Rejoined with paper tape, Very fine, Extremely rare. 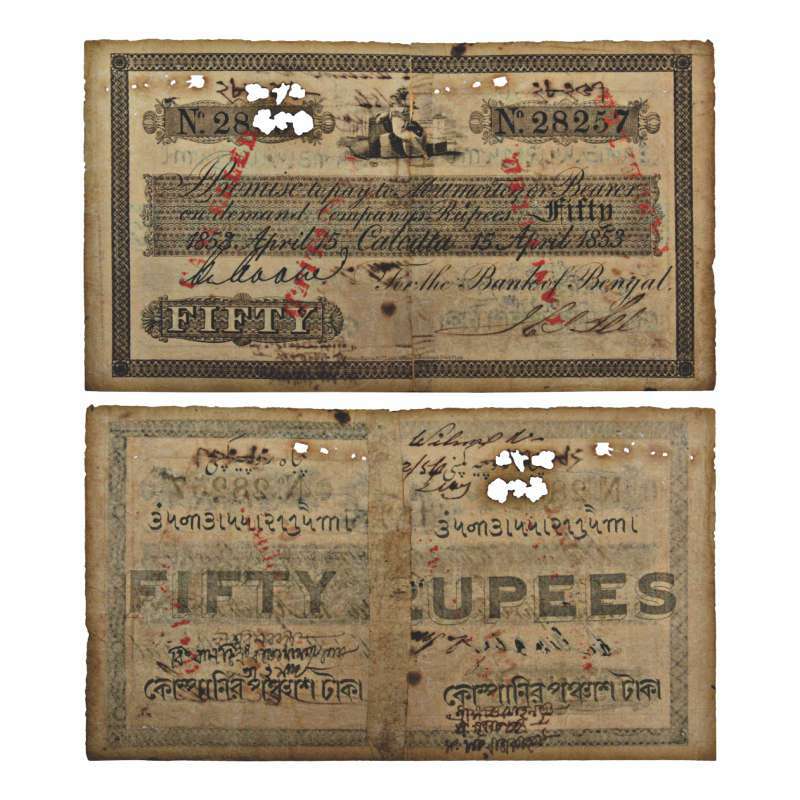 Bank of Bengal, 50 sicca rupees, Calcutta, hand signed, dated 15th April 1853, serial no. : 28257. 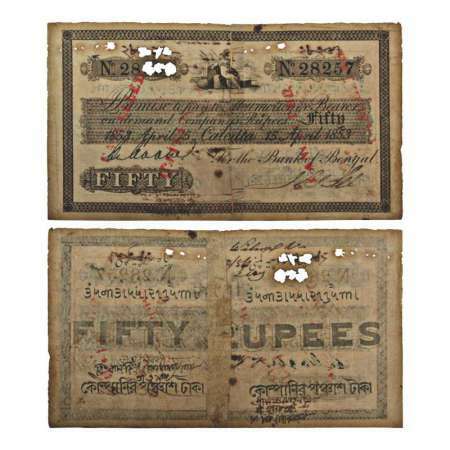 Obv: Personified “Commerce” sitting on articles of merchandise in center, Calcutta in promise text, printed serial number on either side, two pre- printed date in promise text panel on either side, FIFTY in denomination panel in lower left, cancelled s t a m p s . R e v : Denomination written in Devanagari, English and Bengali, J&R 1A.3.9.5. Small holes and rejoined with paper tape on reverse, Very fine, Extremely rare. 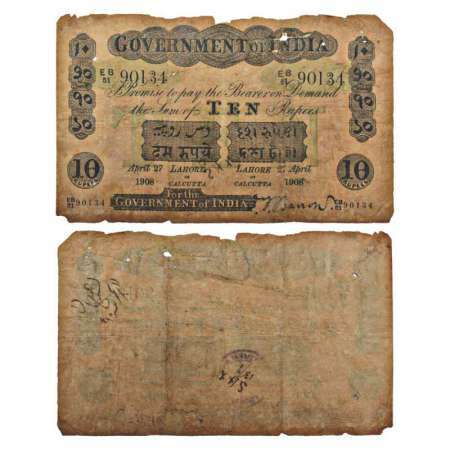 Bank of Bengal, 100 rupees, Calcutta, dated 31st August 1857, prefix 'A', serial no. : 49317, Engraver W.H. Lizars, Edinburgh. 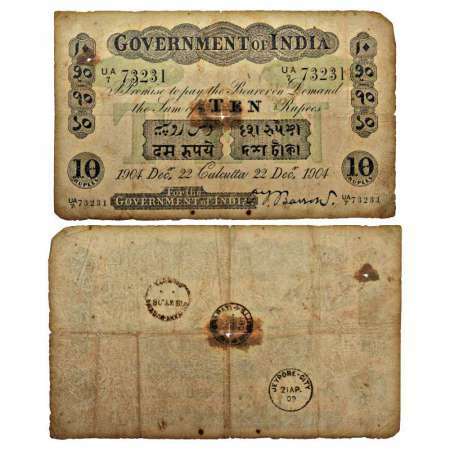 Obv: Britannia with lion accompanied by personified “Commerce” on left, arched BANK OF BENGAL above vignette, denomination in words in center and numerals on either side within promise text. 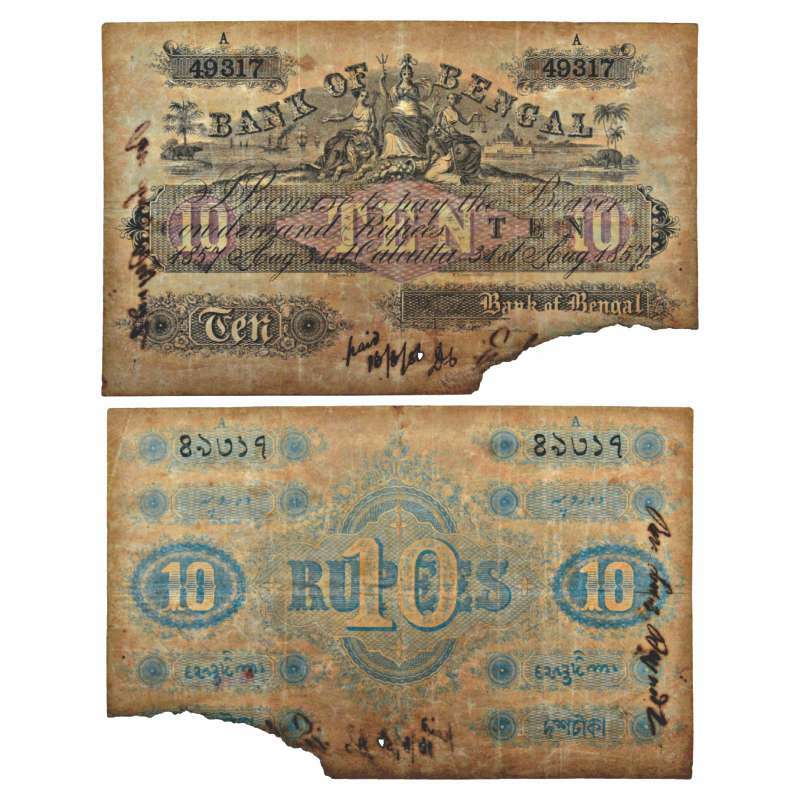 Rev: Serial number in Bangla on either side 10 followed by bold 10 across rupees and 10 in center with denomination in words in Persian above, Kaithi and Bangla below, J&R 1A.3.10.1. Signature cut, Very fine+, Very rare. Government of India, Victoria, Uniface, 5 rupees, 2nd issue, Green underprint, Calcutta circle, dated 4th February 1901, signed by A.F. Cox, serial no. : OA13 64111, four serial numbers on all corners, J&R 2A.1.2A.1. Pin hole, Graded as choice 58 about Uncirculated by PMG, Extremely rare. 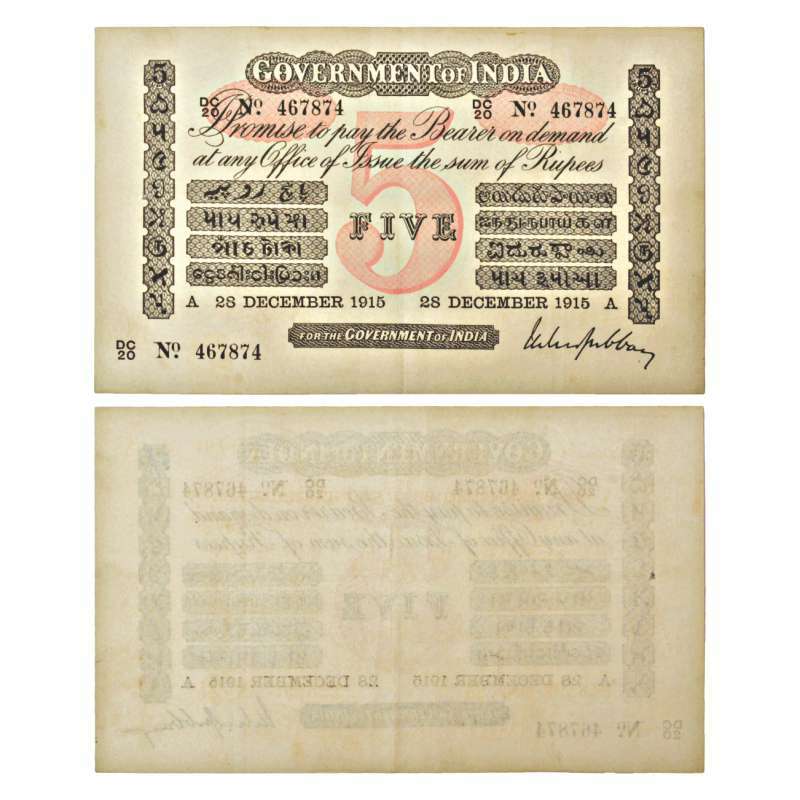 Government of India, Edward VII, Uniface, 5 rupees, 3rd issue, Red underprint, Initial 'B' for Bombay circle, dated 6th June 1905, signed by A.F. Cox, serial no. 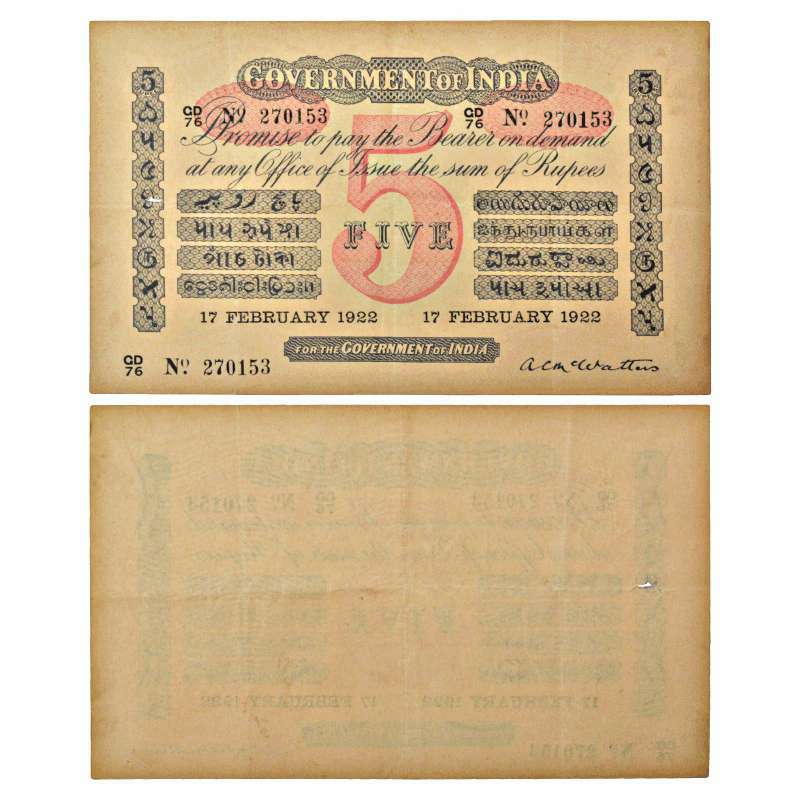 : MA62 79832, four serial numbers on all corners, J&R 2A.1.3A.1. Paper tape adhesion and damage on some parts, Rare. 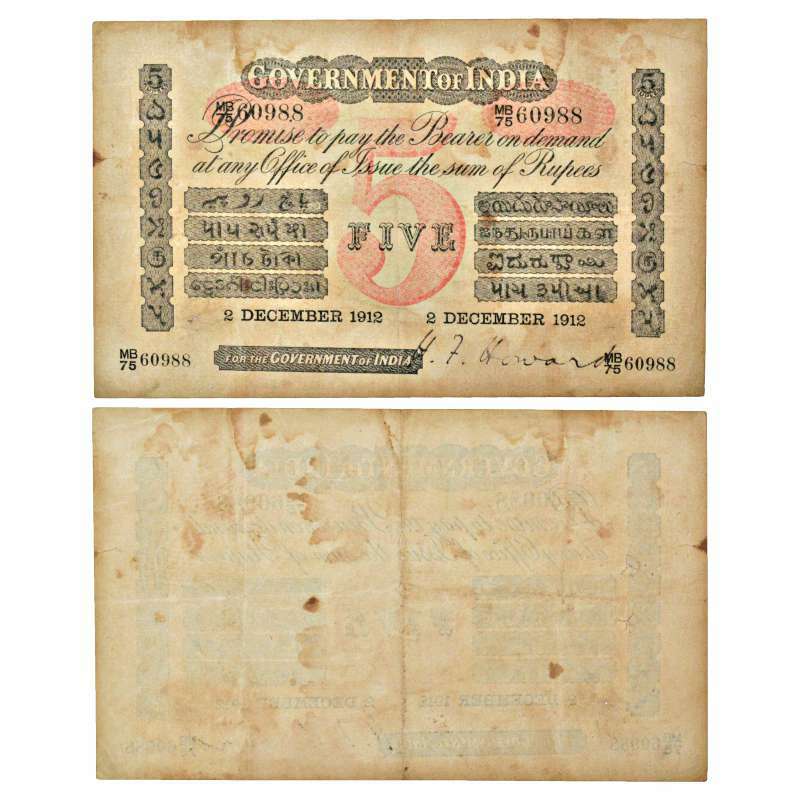 Government of India, George V, Uniface, 5 rupees, 4th issue, Red underprint, Initial 'B (obliterated)' resulting to hole, for Bombay circle, dated 2nd December 1912, signed by H.F. Howard, serial no. : MB75 60988, four serial numbers on all corners, J&R 2A.1.4B.3. 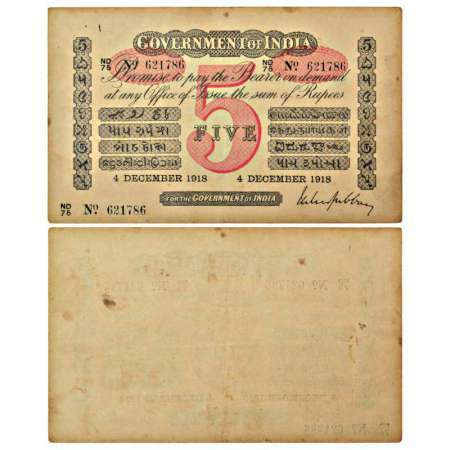 Government of India, Edward VII, Uniface, 5 rupees, 4th issue, Red underprint, Initial 'L' for Lahore circle, dated 26th January 1909, overprint 5 on year 1909, signed by R.W. Gillen, signature not listed in Lahore circle, serial no. 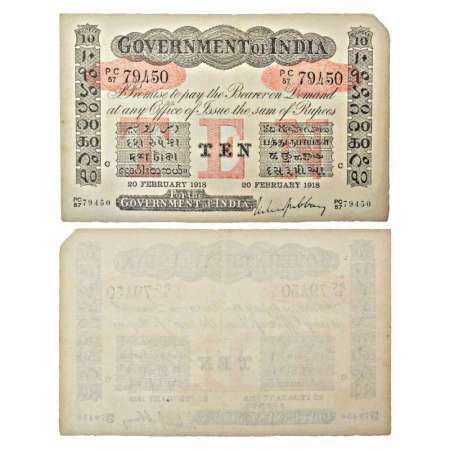 : EB85 75576, four serial numbers on all corners, J&R 2A.1.4E.3. Paper tape adhesion and damage on some parts, Very rare. 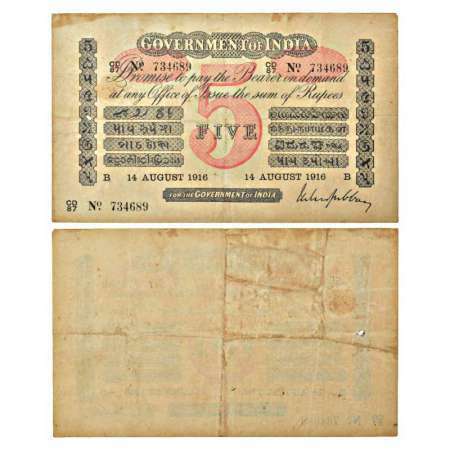 Government of India, George V, Uniface, 5 rupees, 5th issue, Red underprint, Initial 'B' for Bombay circle, dated 14th August 1916, signed by M.M.S. Gubbay, serial no. : CD87 734689, three serial numbers, J&R 2A.1.5B.1. 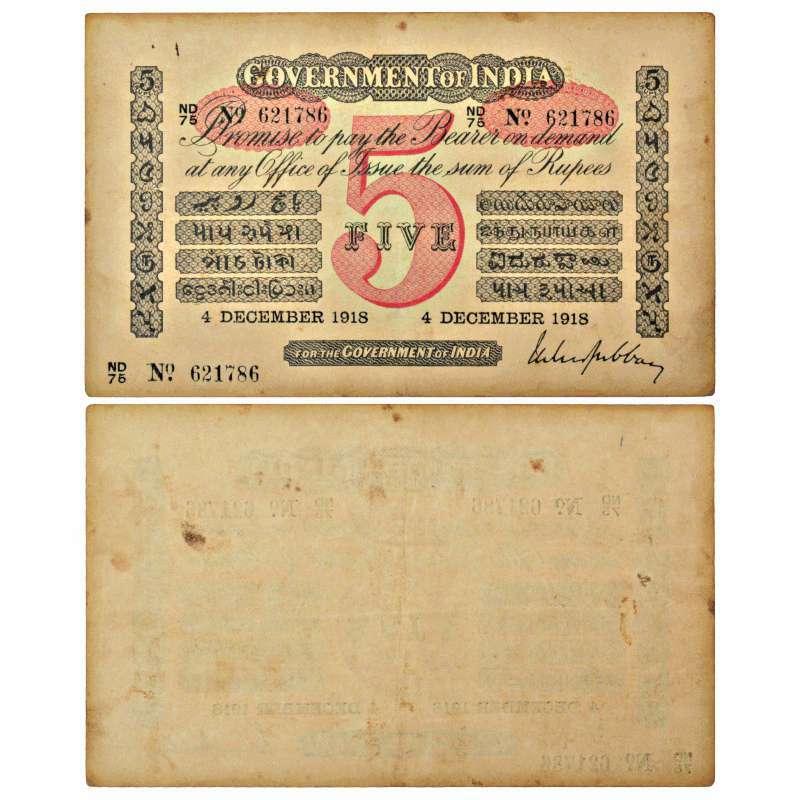 Government of India, George V, Uniface, 5 rupees, 5th issue, Red underprint, Initial 'A' for Cawnpore circle, dated 28th December 1915, signed by M.M.S. Gubbay, serial no. : DC20 467874, three serial numbers, J&R 2A.1.5F.1. Fold marks otherwise about uncirculated, Very rare. 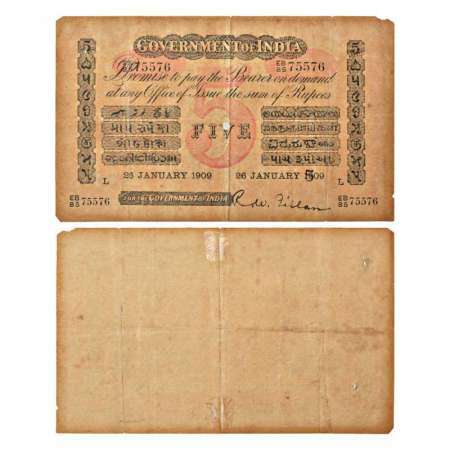 Government of India, George V, Uniface, 5 rupees, 6th issue, Red underprint, No Initial, dated 4th December 1918, signed by M.M.S. Gubbay, serial no. 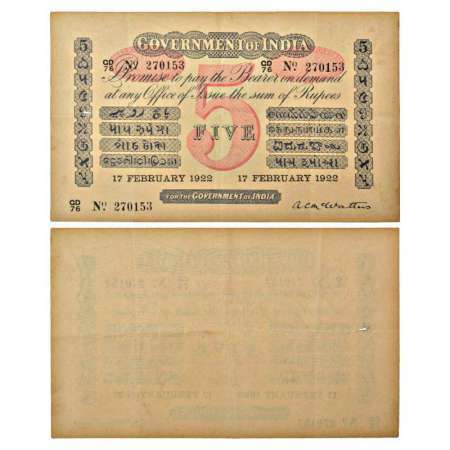 : ND75 621786, three serial numbers, last three digits are fancy no. : 786, J&R 2A.1.6.1. Government of India, George V, Uniface, 5 rupees, 6th issue, Red underprint, No Initial, dated 17th February 1922, signed by A.C. McWatters, serial no. 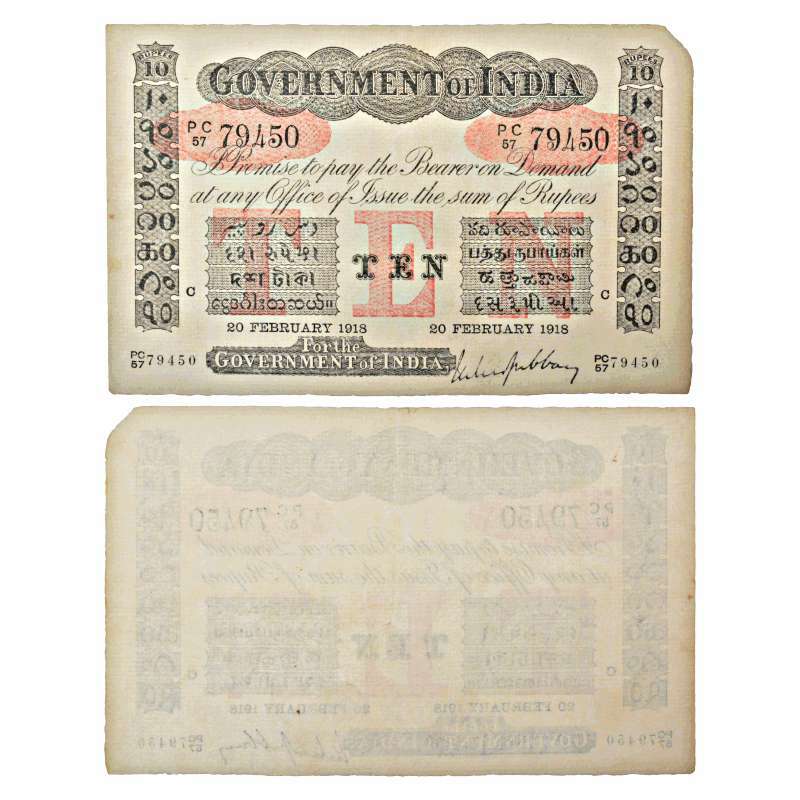 : GD76 270153, three serial numbers, J&R 2A.1.6.2. 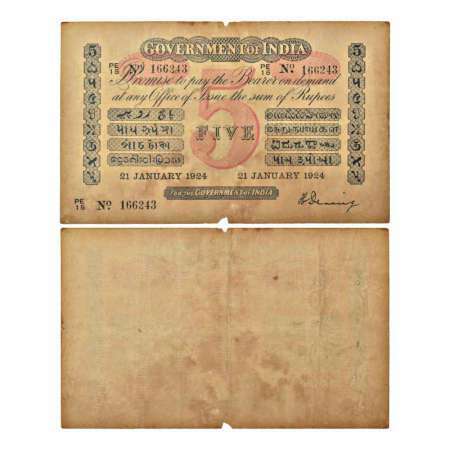 Government of India, George V, Uniface, 5 rupees, 6th issue, Red underprint, No Initial, dated 21st January 1924, signed by H. Denning, serial no. 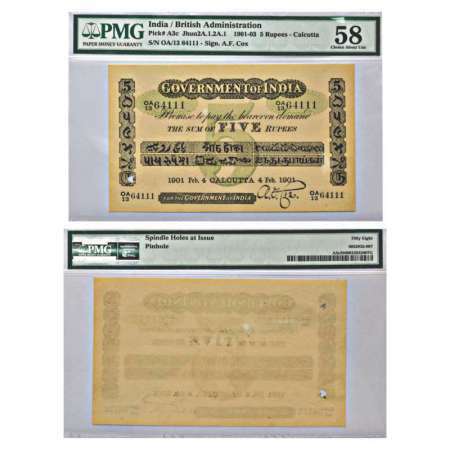 : PE15 166243, three serial numbers, J&R 2A.1.6.3. Tattered from lower middle margin, Very fine, Rare. Government of India, Victoria, Uniface, 10 rupees, 1st issue, Green underprint, Calcutta circle, dated 21st October 1901, signed by A.F. Cox, serial no. : OA68 46590, Two serial numbers, J&R 2A.2.1A.9. 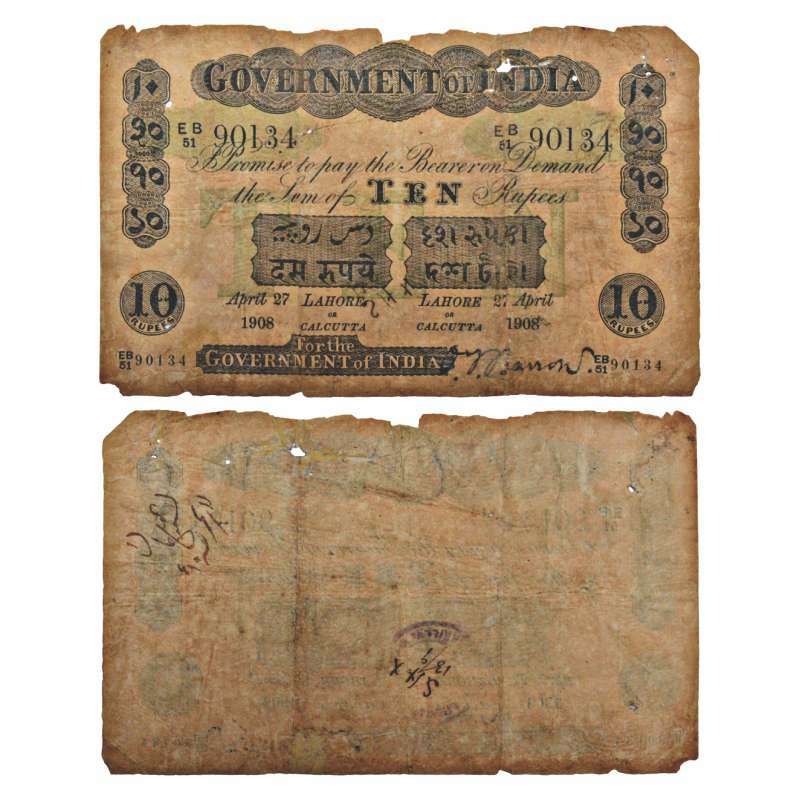 Government of India, Edward VII, uniface, 10 rupees, 2nd issue, Green underprint, Calcutta circle, dated 22nd December1904, signed by O.T. Barrow, serial no. : UA7 73231, Four serial numbers on all corners, J&R 2A.2.2A.2. Rust hole in center, Very fine, Very rare. 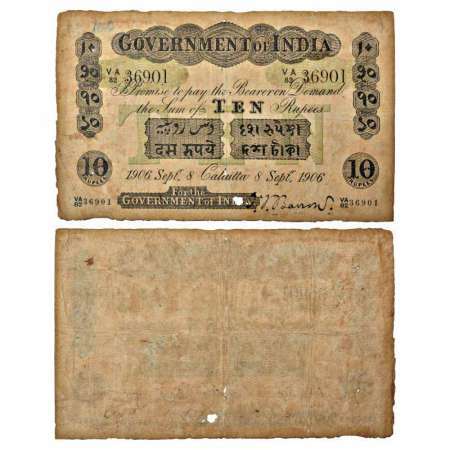 Government of India, Edward VII, Uniface, 10 rupees, 2nd issue, Green underprint, denomination panel type 1, Calcutta circle, dated 8th September 1906, signed by O.T. Barrow, serial no. 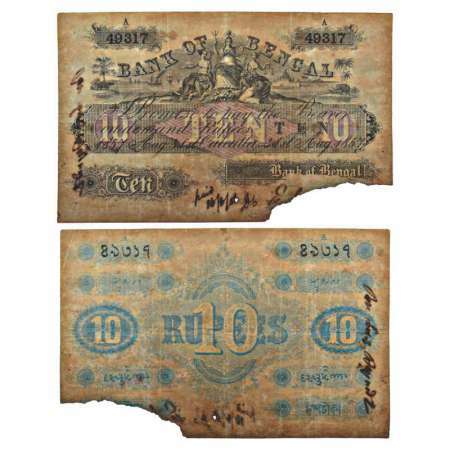 : VA82 36901, four serial numbers on all corners, J&R 2A.2.2A.2. Few holes, Very fine, Very rare. Government of India, Edward VII, Uniface, 10 rupees, 2nd issue, Green underprint, Lahore or Calcutta circle, dated 27th April 1908, signed by O.T. Barrow, serial no. 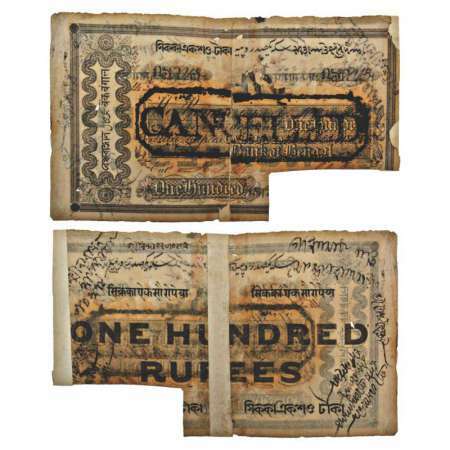 : EB51 90134, Four serial numbers on all four corners, J&R 2A.2.2C.1. Re-Joined and Restored, About very fine, Very rare. 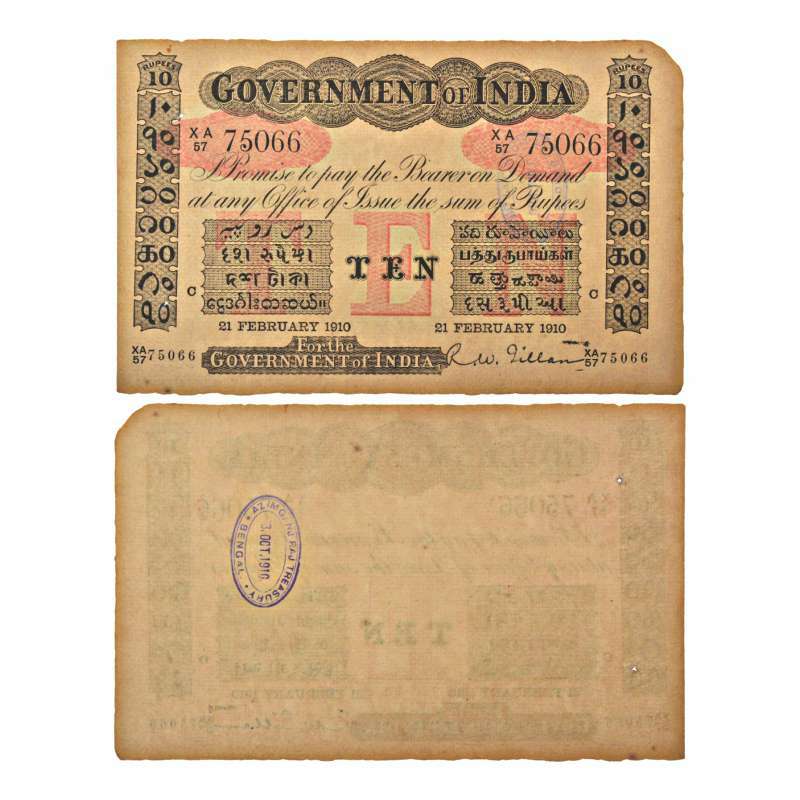 Government of India, Edward VII, Uniface, 10 rupees, 3rd issue, Red underprint, denomination panel type 6, Initial 'C' for Calcutta circle, TEN in center, dated 21st February 1910, signed by R.W. Gillen, serial no. : XA57 75066, four serial numbers on all corners, J&R 2A.2.3A.1. 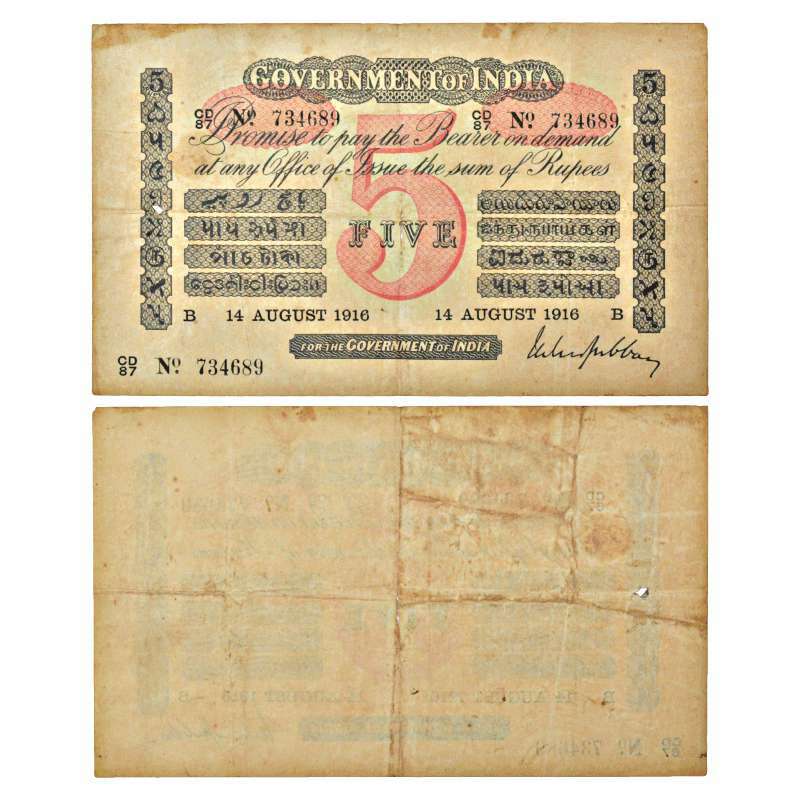 Government of India, George V, Uniface, 10 rupees, 3rd issue, Red underprint, Initial 'C' for Calcutta circle, dated 20th February 1918 signed by M.M.S. Gubbay, serial no. : PC57 79450, four serial numbers on all corners, J&R 2A.2.3A.3. Extremely fine to AUNC, Very rare.